Kayak: Sites like Travelocity and Expedia search flights and hotels for you, but have you ever noticed that their prices vary even when looking at the same thing? Kayak simplifies that by indexing hundreds of sites covering hotels, flights, cars, and deals, ensuring that you get the very best possible prices on your travel needs. Visit the website. Download for iPhone/iPad or Android. TripAdvisor: You don’t want to spend your vacation looking up things to see and places to eat, so let this website and app do the heavy lifting for you before you leave. TripAdvisor consolidates reviews, forums, and opinions for all things local in one easy-to-use place. Visit the website. Download for iPhone/iPad or Android. Kindle: Amazon’s Kindle app turns your tablet into an e-reader and an on-the-go library. Load up on travel guides or download the latest local newspapers to find events and reviews for your destination city. Free books are available from your public library or you can purchase books on Amazon that will be synced across all of your devices. Download for iPhone/iPad or Android. Podcast Players: Those long flights — or longer car rides — can mean hours stuck in uncomfortable seats. Podcasts can make this time much more bearable. Use iTunes or a dedicated app like BeyondPod for Android to subscribe to podcasts before you leave. When downloading them, try to use Wi-Fi whenever possible to minimize charges on your data plan. More on how to use Wi-Fi below. Dropbox: Dropbox’s free cloud storage is perfect for backing up your precious photos and videos. Enable the “Camera Uploads” feature to transfer them when you’re connected to a wireless network. If you’re running out of space on your devices, you can delete photos and videos knowing that your memories are stored safely in the cloud. Best of all, they will be waiting for you on your computer when you get home! Download for iPhone, iPad, Android, PC, and/or Mac. Currency Converter: Are things marked up or does it just feel that way because you’re using a foreign currency? A quick look at a currency converter app will tell you how much you’re really paying. Download for iPhone/iPad or Android. Weather: Chances are you’re going to a destination with weather that’s just a bit different from what you’re used to. Sandals or boots? Shorts or a sweater? Stay ahead of fickle climates and check your weather app before going out to see if you need to dress for sun or rain (or both). Download for iPhone/iPad or Android. PayBack: Traveling with friends? From splitting restaurant checks to chipping in for taxis, sharing bills can be a headache, even for number-savvy people. You can log all your expenses with the PayBack app, and it will calculate the fastest, easiest way to consolidate those IOUs into simple payments. Download for iPhone/iPad or Android. Games: Candy Crush, Angry Birds, Tetris, and even old standards like chess and blackjack can do wonders for your sanity while you’re traveling. Install some of your favorite games (free versions are usually available) to use while stuck in airport lines, waiting for cabs, or just unwinding after a long day of traversing a new city. Download games for iPhone/iPad or Android. Video and Phone Calls: The Skype and Apple’s FaceTime apps can make staying in touch a bit more personal than your standard phone call. Using these apps for video calls provides a unique way for your loved ones to feel close to you when you’re far away. Plus if you need to call a phone number, Skype can do that for you as well. Download for iPhone, iPad or Android. If you’re getting ready for a trip and feel overwhelmed by the possibilities of what your devices can do for you, take advantage of my Computers Made Easy Travel Deal. I’ll help you research your destinations and download and set up apps on your phone and/or tablet. I’ll even make sure you have all the chargers, converters, and other gadgets you need to make your next trip technology stress-free! You’ve heard of Wi-Fi, but how does it exactly work, what can you use it for, and how can it save you money? 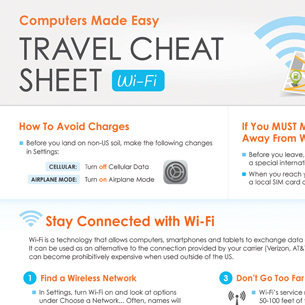 Download my new Travel Cheat Sheet for all your Wi-Fi answers.